With music discovery and playback being so popular on Apple’s iOS devices, it stands to reason that some of the most popular apps and services are centered around the music industry. One of the most popular, and certainly the one that has been around for quite some time is the Shazam music discovery app that allows users to tag and discover music by simply recording a small snippet of the tune and uploading it via the Shazam service. The ShazamTones tweak that has landed on the Cydia store this week is an attempt by UnlimApps to not only extend the functionality that is offered by the Shazam app, but to also promote and hook into their own UnlimTones app that has been available through Cydia for quite some time. ShazamTones recognizes any installation of the official Shazam app, regardless of whether it is the free or paid version, and adds an additional button to the tagged songs section that links directly to the UnlimTones app. This latest tweak is essentially a gateway that bridges the gap between Shazam and UnlimTones, meaning that users can quickly and efficiently search the ringtone service for any songs that they have tagged using the Shazam service. 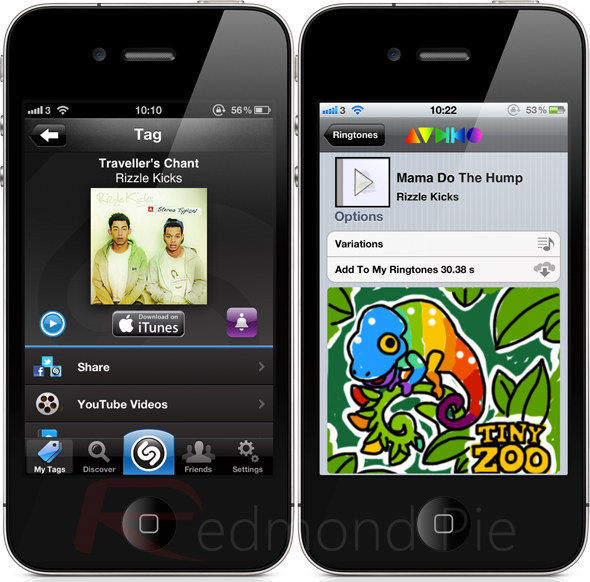 When the button is tapped, the UnlimTones app is invoked and the tagged song is immediately searched for and made available for download if the user requires. It is worth noting that no additional icons or settings or added with this tweak, however, the UnlimTones app is downloaded to the device if it isn’t already installed. The ShazamTones tweak seems to work very well with my tests on a jailbroken iPhone 4S using the free of charge Shazam app. The added button looks extremely polished and doesn’t spoil the look of the Shazam app in any manner. The only issue that I encountered was however, is the fact that a large number of my tagged songs didn’t actually have ringtone equivalents offered through the UnlimTones service. With that in mind, and with both the app and tweak being free of charge, it is definitely worth a try. 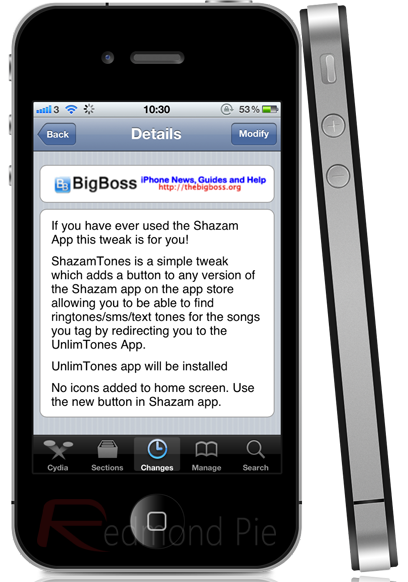 ShazamTones is available as a free of charge download from the BigBoss repository with no iOS requirements being specified.